The SharePoint Org Chart has a number of built in background styles and colours that can be set for each box on an organisation chart. Often these built in styles are sufficient but if required they can be changed. This guide explains how to change those colours and also how to define custom background colours. 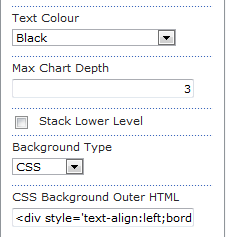 This guide also explains the difference usage scenarios between the Graphical and CSS background options that are available. 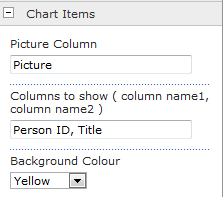 In the Org Chart web part, navigate to Chart Items within this configuration section the Background colour is used to select the desired color. The size of the chart box can be set by adjusting the Size (circled in red) property in either the Chart Items or Assistant Items configuration section. 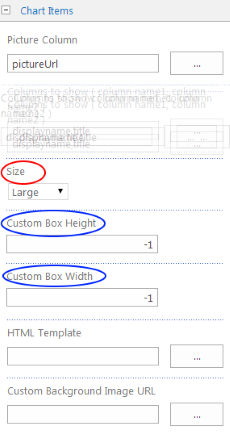 To set a custom background size enter the size in pixels into the Custom Box Height and Custom Box Width properties. Changing to CSS Background Mode.